A photograph taken from The Battle of Loos, 1915. THE BATTLE of Loos, which raged from late September to mid-October 1915, was one of the bloodiest clashes of the First World War. 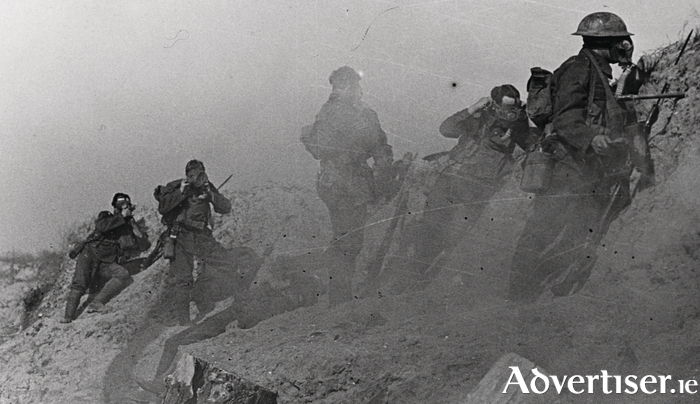 The British Army lost some 60,000 men in the engagement, with little to show for it when the guns fell silent. Gains made on the first day of the attack were not exploited and the Germans soon recaptured the ground they had lost. Among those killed was John Kipling, the only son of Rudyard Kipling, while another participant was poet Robert Graves, who wrote about his experiences in his classic memoir, Goodbye To All That. Gerry Conneely’s one-man show, The Great Push, which has just completed a run at the Town Hall Theatre studio, and which will be performed in Kinvara next month, is adapted from the book of the same name by Donegal author Patrick McGill. McGill, then aged 24, was a stretcher-bearer with the London Irish Rifles, one of the regiments chosen to lead the opening assault of the battle on the morning of September 25. His account was written as the troops were waiting to go up to the front line and in the immediate aftermath of that first day’s action. The scene is set with McGill, and six comrades, in their billet on the day before battle, drinking, chatting, and singing. Tellingly their banter and joshing keeps yielding to fretful silences as each man quietly reflects on what awaits him on the morrow. Later that evening the troops march up to the front and McGill describes the lovely autumn weather and the shattered villages they pass through - where some of the houses are, remarkably, still occupied. Later, as the men wait in the trenches for the coming of day and the signal to attack, he strongly conveys the build up of tension. After a massive dawn bombardment, intended to destroy the German defences, the soldiers finally go over the top and advance through ‘air vicious with bullets’. Conneely’s presentation of the material could not be simpler, a table and chair on a bare stage, but his engaging, nuanced delivery perfectly captures and conveys the atmosphere and richly observational detail of McGill’s writing, drawing the audience in to the story. While McGill himself wrote the book as a young man, Conneely does the play in the persona of an older one, reflecting on his wartime experiences. He makes occasional use of sound effects throughout the show, the angry bursts of gunfire underlining his words. At times the effects are superfluous, as when we hear the sound of a door latch being opened by a man entering the platoon’s billet, and the cannonade which prefigures the regiment’s assault could have been longer, but these are quibbles. One other bit of nit-picking; Conneely could have found a more period-appropriate chair for the piece, rather than the one clearly accessed from the Town Hall’s own modern-day stock. These are minor points in what is otherwise a thoroughly absorbing and compellingly performed show. The Great Push, with Gerry Conneely, will be performed in the old Courthouse, Kinvara, on Saturday March 5 at 8pm. Tickets are €10 and available at the door. Gerry is contributing 50 per cent of his takings to the KAVA Courthouse restoration fund.